01:00 scr267 i'm attempting to modify a lua script to set physics_speed to the group property of some boots, but there doesn't seem to be any effect... Does anyone have any suggestions? 02:58 GreenDimond is the forum down for anyone else? 03:01 VanessaE I'm only a moderator there and have no control over that aspect. 03:03 erstazi VanessaE: ah ok. Thanks! 03:17 erstazi This is odd. I have 0.4.16 with homedecor with unifieddyes and moreblocks and moreores. I had a world created before that had colored chairs. Let's say black chair. If I remove the chair then the chair reverts to a white chair. And I cannot craft colored chairs. 03:18 erstazi Did a git pull for all the mods and I am at the latest for each. 03:28 erstazi Oh, I see the issue now! 03:54 BBmine Forums are down for me as well. 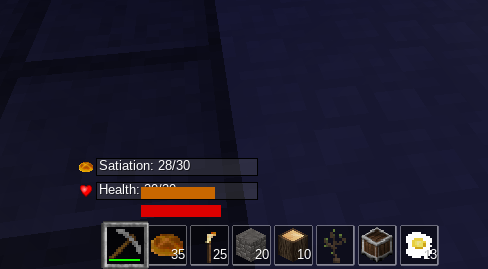 03:56 BBmine On a different topic, does anyone know how to go back to minetest stable from a compiled minetest-dev? 03:57 habeangur BBmine: you did make && make install? 04:00 habeangur BBmine: deleting files? 04:00 BBmine Yes, it's the way I did it last time. 04:00 BBmine And it worked. 04:01 BBmine Wait, are you XtremeHacker? 04:02 BBmine I thought you was a hacker when I first saw that name. 04:11 BBmine How have you been doing? 04:11 BBmine I'm not doing very well. 04:14 BBmine I think there's something wrong with c55's database server. 04:14 muhdnurhidayat btw, google search found the thread "Forum is now hosted by celeron55" so maybe it's on c55 side error? 04:16 BBmine I think google searches are kinda old. I know on my forum it takes a while for google to wake up. 06:50 tm3 is it annual database repair and upgrade or something ?? 06:50 jas_ dunno, maybe it just needs a restart. 06:51 jas_ mm, i read c55 hosts it, but i dunno what that means. 06:52 jas_ i'd suggest irc but we're already here. do you like github? 06:53 jas_ usually servers have channels and mods idle there, i think. 06:54 jas_ is it a channel here on freenode? 06:54 jas_ oh i read that as "outrage" whoops! 07:14 leo_rockway hey, I don't know if you guys are already aware, but the forum is down. There's an issue with the DB. 12:42 srifqi Anybody knows what will I get when I do minetest.settings:get("mgv5_np_ground") ? Will it be a table? How to store it? 12:55 srifqi "2017-09-09 19:51:13: ERROR[Main]: Setting [mgv5_np_ground] is a group." 12:57 srifqi So, we can't use minetest.settings:get() to get a group, Krock ? 13:19 rdococ I'm adding a simple day counter system that will announce sunrise and sunset. 13:24 srifqi Let me try. 13:38 compro hello!! I want to destroy a water well/source I built. How to do it? 13:39 srifqi Try picking using Empty Bucket or just place a block in it. 15:03 srifqi Have you try to press F5 to check coordinates, Asad3ainJalout ? 16:36 rdococ Asad3ainJalout: can't you set noclip ingame? 17:02 Natechip whats that habanhur? 19:37 compro what are waterlilies used for? 20:32 rdococ sy: what server is that from, btw? 20:32 rdococ ooh, what address? 21:53 rdococ sy: what port? 22:02 rdococ sy: what channel? 23:16 greeter hmm odd question. is it possible to use worldedit or other tools to set/place ignore nodes? 23:27 VanessaE technically if you delete a mapblock, the result acts exactly like a block full of "ignore"
23:27 VanessaE also in one case, I ended up with a dozen or so mapblocks where air had been transmuted into ignore. not sure how that happened. 23:34 VanessaE the /deleteblocks command. 23:37 VanessaE how do you build with an invisible node? 23:39 VanessaE what's the use case? 23:39 VanessaE wouldn't one of maptools' nodes work? 23:39 greeter hmm are there any that are invisible and cause no fall damage from landing on them? 23:39 VanessaE not sure about that. 23:41 VanessaE maptools is an essential mod. 23:41 red-001 isn't there a group or something for no damage? 23:51 Fixer Wuzzy: you here? 23:57 Wuzzy can you reproduce this locaally (!!!)? 23:57 Fixer Wuzzy: i can, remind me how it is named? 23:59 Wuzzy did you reset all config?